Remove any seeds from the orange and lemon slices and place them in the bottom of a large pitcher. Using a muddler or wooden spoon, gently muddle the fruit to release some of the juices. Add the strawberries, raspberries, red wine, triple sec and orange juice. Stir to combine, cover and refrigerate for a minimum of 6 hours. 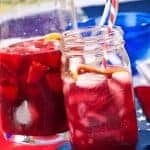 To serve, pour the sangria over ice, add some of the berries if desired and garnish with a fresh slice of orange or lemon.